The Fellowship was fortunate enough to obtain a copy of LOST VEGAS #1 from Image Comics. Jim McCann writes and Janet Lee draws. Imagine a giant casino in space that uses indentured servitude across all of the species in the galaxy. Now imagine a guy who’s been stuck there for five years working on a way to escape. And now imagine that it won’t be as easy as all that. Welcome to the fabulous Lost Vegas! Roland seems like a nice enough guy, if not particularly lucky. I find myself wondering if his name is meaningful; Roland is a name from legend. We’ll see. It’s an old story, too, but in a fun new setting with interesting characters and a sense of danger and intrigue. Ink might be the coolest of them all, too; I look forward to seeing what he can do. This looks like the beginning of an exciting story, with lots of twists and turns along the way. Roland seems like the kind of guy who’s as good at getting out of trouble as he is at getting into it. Pick this one up. 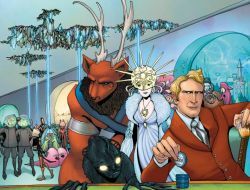 LOST VEGAS #1 is available now at your FLCS or by order at imagecomics.com.